This week’s Photo Challenge is Nostalgic. 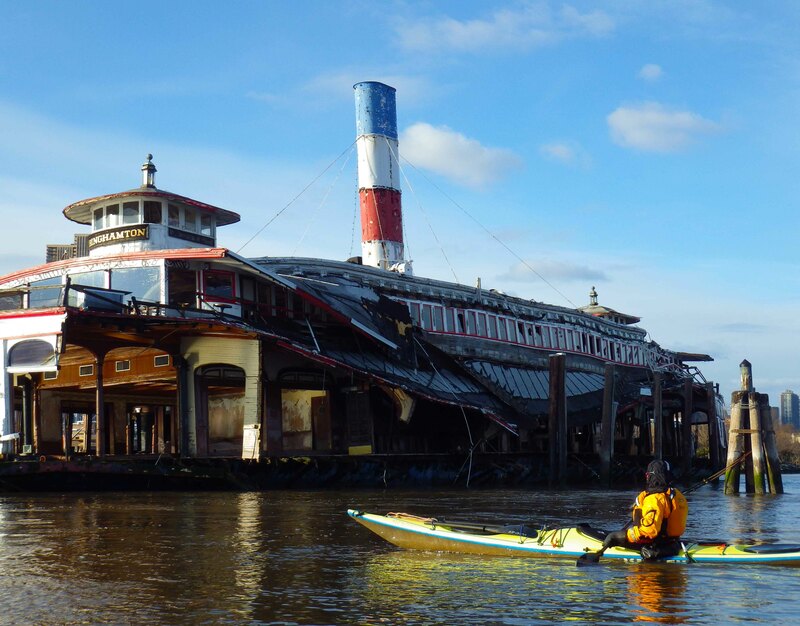 Kayaking through New York City’s waterways and becoming aware of the maritime traditions of the harbor, it’s hard not to become nostalgic about its bygone days, reflected in the numerous wrecks of ships, some of them over a hundred years old, that lie here and there in the harbor. 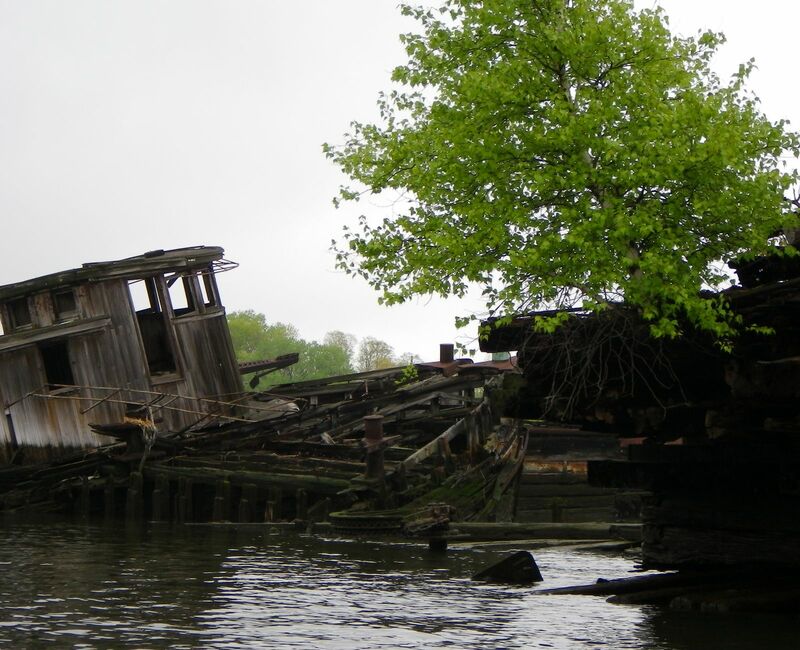 A case in point is the Binghamton, a 1905 steam ferryboat—the last of many—that has reached her last resting place, as it now clearly is, on the New Jersey side of the Hudson at Edgewater. The Binghamton operated as a cross-Hudson ferry, making a mile-long trip back and forth between Hoboken and Manhattan, continuously from 1905 to 1967, when the last ferries were forced out of business (until their recent renaissance) by competition from the Hudson tunnels and the George Washington Bridge. 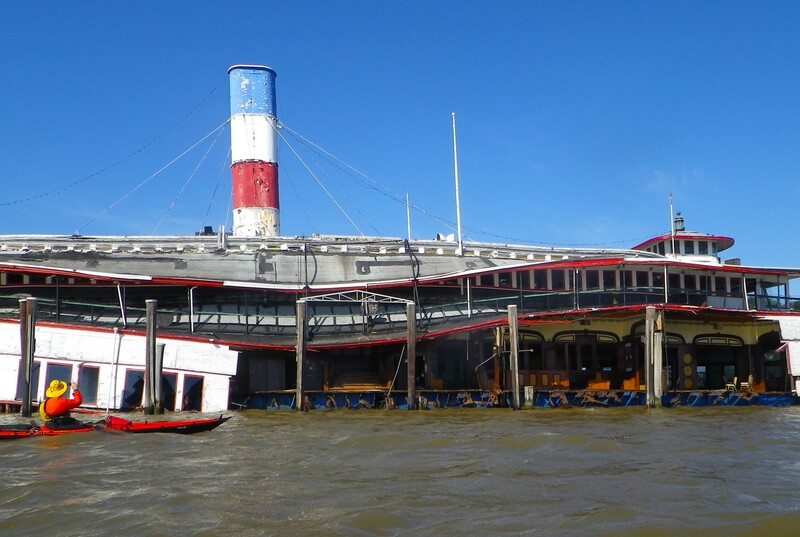 Binghamton was then converted into a floating restaurant. The restaurant closed in 2007, and since then Binghamton has awaited a new use. The Binghamton is significant as possibly the last surviving steam ferry still afloat built to serve New York Harbor, the birthplace of commercial steam navigation, the birthplace of the double-ended steam ferry, and an area whose development was profoundly shaped by the introduction of vessels of this kind. Indeed, The US Department of the Interior added Binghamton to the National Register of Historic Places in 1982. Bill Lee has written a loving, detailed essay on her history, and Tugster has posted a series of photos (here, here, and here) that give a good idea of her interior as it was until quite recently. Bill Lee’s essay ends when Binghamton‘s future still looked promising. Unfortunately, in 2011 Hurricane Irene greatly accelerated her progressive deterioration, and last year Hurricane Sandy finished the job. Binghamton no longer floats, but is resting on the bottom. Every time we paddle past, we see greater decay. Now an entire side of the boat is down, giving us dramatic views into the inlaid wood and stained glass of the interior—all ruined now. Water sloshes back and forth through the interior spaces with each passing wave. 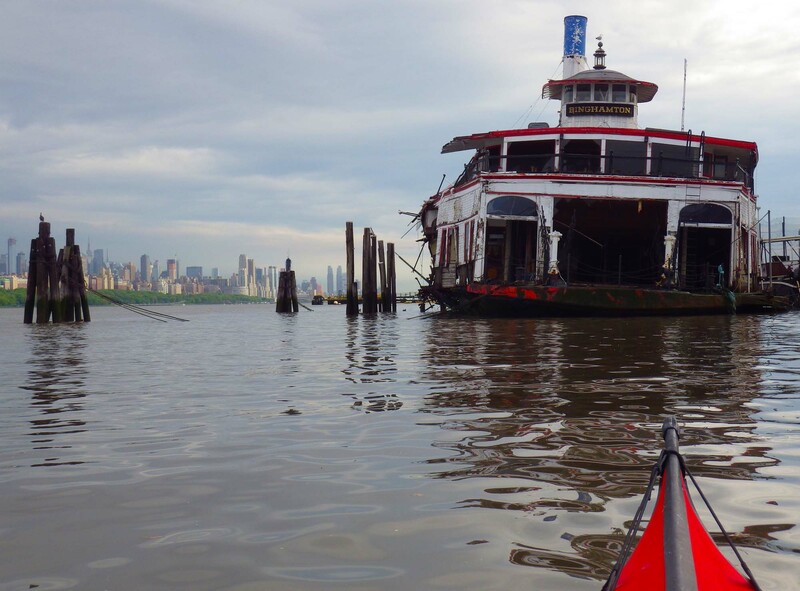 This entry was posted in Kayaking, New York City, Photography and tagged Binghamton Ferryboat, Kayaking, New York Harbor, Nostalgic, Photography, postaweek, postaweek2013, Weekly Photo Challenge. Bookmark the permalink. Wabi-sabi. Water speeds decay in many ways. The new lines created by the sinking of the ferry are a sort of improvement, like a dying person coming briefly to life before the end. Very nice photo essay as usual, Vlad. Thanks for the interesting commentary to go with the lovely photos. Seeing a boat/ship die like this is sad. :) Hence the name I’m guessing…Tugster? I think most photographers I know, including myself have their favourite thing they like to shoot. For me it’s doors, can’t get enough of them! Yes, Tugster for that reason. I linked to three of his Binghamton posts above. His blog is here. Excellent I shall check it out… yes doors ;) What’s not to like? Doors are great! Especially in countries where they are older and have a bit more character… I’ve seen lots of nice window photo too. I have a whole collection of very ancient doors from when I walked across Spain some years ago, visiting places off the beaten path, deserted medieval villages with fabulous huge old wooden doors. Great stuff. Windows are good too. Venice, Italy is a great place for doors and windows, have many of those photos too. I think I just love shooting architecture, the older the better! What’s your theme, other than tugs? The tugboat race is held on the Sunday before Labor Day, I believe—that would make it September 1 this year. I have paddled by her many times myself Vlad without being aware of her significant history and sadly, never taking the time to look it up (that despite almost becoming a nautical archaeologist many years ago). You have inspired me to learn more of her history. By far the best overview of her history—both gripping and technically detailed—is the essay by Bill Lee that I linked to in my post. So sad to see this bit of history literally go under. Thanks for sharing her history and what appears to be her ultimate demise. Seeing this remind me the ship ot Titanic..
…or in your case, kayak around it. I read the submarine story. I can’t believe I missed all of those interesting bits of history while growing up in NY. It’s probably because I spent so most of my time in Central Park as a child instead of the harbor. The submarine story was intriguing but I must say, the vessel itself looks kinda spooky. Cool secret place though! Oh, “Alice”! Our friend Val has one of her earliest childhood memories there. If I’m remembering her anecdote correctly, she was so small as to fit under the mushroom (which means she could barely toddle)….. That is a wonderful recollection for you to have! That ferry boat is amazing. I hope to visit your city one day – there’s so much that you’ve shown that we need to see. Wonderful journey down memory lane- NYC is a fascinating place, I still have to see it! It really is sad, what happens to the beautiful old ships and boats that no one has use for anymore. At least on land the decay is slower. Great essay! Excellent Vladimir – really enjoyed this one! 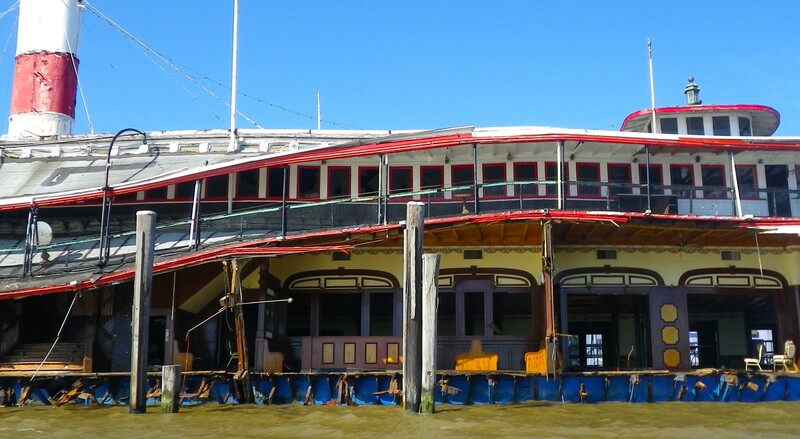 But at least she is serving us well as a bit of nostalgic ornamentation in New York’s water ways. Cleaning up the harbor and rivers is great — I love Brooklyn Bridge park – but I would not like to see New York turned into Disneyland. Of course you are right, Vlad — NY is chaos on a grid system. But then there is SoHo. Last time I was there it was a Disney-like outdoor shopping mall. I remember the artists lofts and mystery it held for the urban explorer. 50 years ago it would have been hard to imagine the state of that neighborhood today. Now that’s anarchy! I struggle between encouragement of chaos and anarchy and a Calvinistic desire for things to be RIGHT! Lately the anarchy is winning…. So cool. I love stuff like this. Hey I nominated you for: http://blueribbonfair.wordpress.com/2013/07/11/so-happy-the-wordpress-family-award/ if you are interested. I thought I replied back to you on this, but not showing. Oh well, 2’s the charm if so. You are so welcome. That’s sad about the boats being left to nature. The Binghamton was a beauty in her day, sad to see the state she is in now. That’s very sad. We have an old steam ferry in San Diego and it’s home to the SD Maritime Museum. It’s beautiful inside and out and I hope it doesn’t decay anytime. 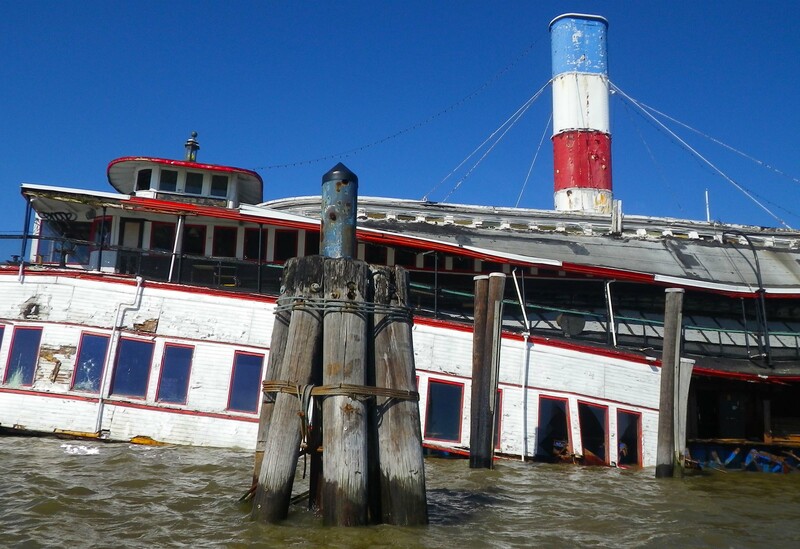 let me join with a news story from kurt of news 12 NJ that there are plans, PLANS, to move a NEW old ferry into Binghamton’s location soon . . after the old one is haul away in pieces in a scow. as news folks like to say . . . watch that spot.